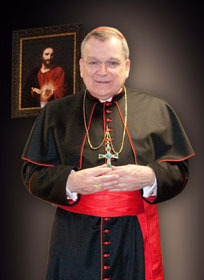 by His Eminence Raymond Leo Cardinal Burke, D.D, J.C.D. On Holy Thursday in 2003, during the twenty-fifth year of his service as Successor of Saint Peter, Our Holy Father Pope John Paul II gave us a wonderful Easter gift. His ministry as Successor of Saint Peter has been marked by a comprehensive and most rich presentation of the Catholic faith and its practice. As a priest, I have always been inspired by the letter which he has written to priests on every Holy Thursday. Each of these letters has been a reflection, in some way, on the Holy Eucharist, the heart of the priestly life and ministry. On Holy Thursday in 2003, in place of his annual Letter to Priests on the great gifts of the Holy Eucharist and the ministerial Priesthood, the Holy Father wrote a letter to all of the faithful on the mystery of the Holy Eucharist. He signed the Encyclical Letter Ecclesia de Eucharistia, “On the Eucharist in Its Relationship to the Church,” during the celebration of the Mass of the Lord’s Supper at the Basilica of Saint Peter in the Vatican. Ecclesia de Eucharistia was the Holy Father’s wonderful Easter gift to us in 2003. In the twenty-fifth year of his pontificate, our Holy Father chose to give thanks to God for the years of his service as Successor of Saint Peter by dedicating his fourteenth encyclical letter to the Holy Eucharist, the source and highest expression of our life in Christ. Clearly, he could not have more fittingly expressed his gratitude for the Holy Eucharist and for his ministry as priest, Bishop and Pope, which comes from and is in service of our Eucharistic Lord. The Holy Father places the Encyclical Letter within the context of the new evangelization and, more specifically, the Year of the Rosary (October 2002-October 2003) as a privileged means of the new evangelization. By announcing the Year of the Rosary in his Apostolic Letter Rosarium Virginis Mariae, “On the Most Holy Rosary,” the Holy Father has urged us to renew the ancient devotion of praying the Rosary, contemplating the face of Christ through the eyes of His Mother, the ever-Virgin Mary, so that we might live in Christ more fully each day. With the Encyclical Letter “On the Eucharist in Its Relationship to the Church,” which is a kind of crown of all of the Holy Father’s rich teaching of the faith and its practice, Pope John Paul II invites us to contemplate the “Eucharistic face”of Christ. From the time I began my ministry as the Successor of Peter, I have always marked Holy Thursday, the day of the Eucharist and of the priesthood, by sending a letter to all the priests of the world. This year, the twenty-fifth of my Pontificate, I wish to involve the whole Church more fully in this Eucharistic reflection, also as a way of thanking the Lord for the gift of the Eucharist and the priesthood: “Gift and Mystery”. By proclaiming the Year of the Rosary, I wish to put this, my twenty-fifth anniversary, under the aegis of the contemplation of Christ at the school of Mary. Consequently, I cannot let this Holy Thursday 2003 pass without halting before the “Eucharistic face” of Christ and pointing out with new force to the Church the centrality of the Eucharist (n. 7a). The Holy Father had reminded us, in his most instructive Apostolic Letter Novo Millennio Ineunte, “At the Close of the Great Jubilee of the Year 2000,” that the new evangelization is nothing less than turning to Christ anew, looking upon His face and taking up, with Him, the cross, the daily conversion of life, by which we grow in holiness of life. The observance of the Year of the Rosary was key to the new evangelization. By praying the Rosary, we find new energy and enthusiasm in studying and living our Catholic faith, for the prayerful meditation on the mysteries of the Holy Rosary leads us to a deeper knowledge and love of Christ. Our Holy Father has even enriched our praying of the Rosary by adding five new mysteries, the Luminous Mysteries, in order that our meditation upon the great mystery of God’s love for us in Jesus Christ may be more complete. Most central of all to the new evangelization is the Holy Eucharist, our communion with Christ in His true Body and Blood. In fact, the Rosary always leads us to desire the fullest possible communion with Christ, which we have in the Holy Eucharist, and it is a way for us to extend our Eucharistic communion with Christ throughout the day. It comes as no surprise, therefore, that the Holy Father, having exhorted us to pray the Holy Rosary as an essential tool for the new evangelization, then presented to us the Encyclical Letter “On the Eucharist in Its Relationship to the Church” as we go forward in carrying out the new evangelization in our homes, parishes and communities. In seeking to live our Christian life with new enthusiasm and energy, we turn first to the Holy Eucharist, our most privileged encounter with Christ on this earth. “The Church from the Eucharist” is comprised of an introduction, six chapters and a conclusion. In the Introduction, the Holy Father points out the central place of the Holy Eucharist in the life of the Church and provides a summary of some of the most important documents of the Church’s teaching on the Holy Eucharist. The Holy Father points out a contrasting situation regarding the Holy Eucharist in the Church today, which he, as Bishop of the Universal Church, must address. On the one hand the reform of the Sacred Liturgy, in accord with the teaching of the Second Vatican Ecumenical Council, “has greatly contributed to a more conscious, active and fruitful participation in the Holy Sacrifice of the Altar on the part of the faithful” (n. 10a). The new Order of the Mass, which may be celebrated in the vernacular, makes it possible for us to enter ever more fully into the Eucharistic Sacrifice. To the degree that we prepare ourselves well for participation in the Holy Mass and, then, give our full attention to the words and actions of the Mass, the reform of the Sacred Liturgy achieves its most noble end. Among what the Holy Father calls the “lights” of the liturgical reform he mentions the increase of Eucharistic devotion and of worship of the Most Blessed Sacrament outside of the Mass. He mentions, in particular, the “devout participation of the faithful in the Eucharistic procession on the Solemnity of the Body and Blood of Christ” (n. 10). Also, I note with deep joy the extended periods of exposition of the Blessed Sacrament each week in many parishes. Some parishes and institutions have continuous adoration of the exposed Blessed Sacrament. What countless blessings have come to the Church and the world through the never-ceasing prayers before the presence of our Eucharistic Lord. On the other hand, the Holy Father realistically points out “shadows” in our Eucharistic faith and practice. He points out the abandonment of Eucharistic devotion and adoration in some places of the Church. He also notes the liturgical abuses which have occurred through a mistaken or incomplete understanding of the reforms mandated by the Second Vatican Ecumenical Council. Liturgical abuses introduce confusion about the Church’s faith in the Most Blessed Sacrament. The Holy Father could not fail to mention a certain “reductive understanding of the Eucharistic mystery,” which is expressed in an exaggerated emphasis upon the Holy Eucharist as Banquet, without a proper understanding of the Eucharist’s “sacrificial meaning.” The Holy Eucharist is indeed a Banquet, but the Heavenly Food of the Banquet is the Body and Blood of Christ offered on the altar, one with the Sacrifice of Calvary. The Holy Father also mentions a tendency to obscure the necessity of the ordained priesthood, which comes through apostolic succession from Christ Himself, for the celebration of the Holy Eucharist. It is always helpful to return to the institution of the Holy Eucharist at the Lord’s Supper, at which our Lord also instituted the ministerial Priesthood, so that He might renew His Sacrifice on Calvary in every time and place (n. 10c). The “lights” and “shadows” indicate for us all the need to treasure anew the greatest gift which Christ has given us in the Church, the Holy Eucharist. New enthusiasm and new energy in studying and living our Catholic faith is necessarily new enthusiasm and new energy in contemplating the “Eucharistic face” of Christ. Our reflection now turns to the six chapters of Ecclesia de Eucharistia: Mystery of the Faith; The Eucharist Builds the Church; The Apostolicity of the Eucharist and of the Church; The Eucharist and Ecclesial Communion; The Dignity of the Eucharistic Celebration; and At the School of Mary, “Woman of the Eucharist.” May our reflection upon the mystery of Christ’s abiding presence with us through the Eucharistic Sacrifice and Banquet be at the heart of our work to carry out the new evangelization of our world. In the Introduction of the Encyclical Letter Ecclesia de Eucharistia, the Holy Father expresses the desire to “rekindle” our wonder at the Eucharist, “the source and summit of the Christian life” (n. 11). Rekindling our wonder at the Holy Eucharist is at the heart of the new evangelization to which we are called at the dawn of a new Christian millennium. Our Holy Father made clear to us, in his Apostolic Letter Novo Millennio Ineunte, that the program of the new evangelization is Christ Himself. The Holy Father instructs us to contemplate the face of Christ, to recognize His presence with us in the Church, most of all, in the Sacrament of His true Body and Blood, and so to become more and more like Christ in our daily living. After the consecration of the bread and wine, that is after the bread and wine have become truly and completely the Body and Blood of Christ, and after the priest has shown the Body and Blood of Christ to the congregation and has adored Christ by genuflecting before the Sacred Host and the Precious Blood, he immediately invites the congregation to proclaim the mystery of faith. The congregation then sings or says: “Christ has died, Christ is risen, Christ will come again” or one of the other memorial acclamations which all have the same content: Christ’s Passion and Death, His Resurrection and His Return in Glory at the end of time. The memorial acclamation reflects the deepest truth about the Holy Eucharist, its inseparability from the Passion, Death and Resurrection of Christ. This sacrifice [of Calvary] is so decisive for the salvation of the human race that Jesus Christ offered it and returned to the Father only after he had left us a means of sharing in it as if we had been present there. Each member of the faithful can thus take part in it and inexhaustibly gain its fruits” (n. 11c). The Holy Eucharist is indeed the “inestimable gift” of Christ to us, before which the only fitting response is adoration. The celebration of the Holy Mass truly makes us present at the sacrifice of Calvary. The Holy Eucharist is not just one of the many gifts which Christ has left to us in the Church. It is the gift of Christ’s true Body and Blood, the gift of the whole fruit of His saving Passion and Death (n. 11b). All the other gifts of Christ to us are only fully understood in relationship to the gift of the Eucharistic Sacrifice and Banquet. That is why the Holy Father rightly first turns to the teaching on the Holy Eucharist in assisting us to carry out the new evangelization. Contemplating the face of Christ at the Lord’s Supper and at every celebration of the Mass, we contemplate His love, the incarnation of Divine Mercy which “knows no measure” (n. 11c). When Christ instituted the Holy Eucharist, he declared the bread to be His Body given for us and the wine to be His Blood poured out for us. The Holy Eucharist is not simply a partaking in the Body and Blood of Christ, not simply a banquet, but is always, at the same time, a sharing in Christ’s sacrifice. The Heavenly Bread, which is the Holy Eucharist, is essentially sacrificial, it is the Body and Blood of Christ, offered and poured out for us as He gave up His life for us on the cross. The sacrifice of the Cross is perpetuated at every celebration of the Mass. Communion with the Body and Blood of Christ is always participation in Christ’s Suffering and Dying. It is important to understand that the sacrifice of Christ is one. “The Eucharist thus applies to men and women today the reconciliation won once for all by Christ for mankind in every age” (n. 12b). This is the great wonder and treasure of the Holy Mass. The Mass is not an additional sacrifice to Calvary. It is not a constant multiplication of the one sacrifice of Calvary. It is the sacrifice of Calvary, it is Calvary’s “commemorative representation,” which, by the universal charity of Christ, makes his “one, definitive redemptive sacrifice always present in time” (n. 12c). In the Sacrifice of the Mass, Christ offers Himself completely to God the Father. God the Father, in response to the total obedience of His Son, gives Christ eternal life by raising Him from the dead. We, the Church, sharing in Christ’s sacrifice, are called to offer ourselves in union with Christ. We are called to share in His universal charity, which “knows no measure.” Through the Holy Eucharist, God the Father responds to our sacrifice with the gift of eternal life. Pope John Paul II reminds us: “The Eucharistic Sacrifice makes present not only the mystery of the Saviour’s passion and death, but also the mystery of the resurrection which crowned his sacrifice” (n. 14). Christ can only become the Bread of Life for us because He is risen from the dead and is alive for us in the Church. We refer to the living presence of Christ with us in the Holy Eucharist as the Real Presence. In order to help us understand more fully the meaning of the Real Presence, our Holy Father refers us to a text of Pope Paul VI who explained that the term does not imply that the other presences of Christ in the Church are “not real,” but underlines that the Eucharistic presence “is a presence in the fullest sense: a substantial presence whereby Christ, the God-Man, is wholly and entirely present” (n. 15a). The proper term for the change of the bread and wine into the Body and Blood of Christ, which takes during the Holy Mass, is transubstantiation. No other term has been found to be as adequate in pointing to the Eucharistic mystery. Theologians and saints, down the Christian centuries, have desired to plumb ever more the depth of the mystery of the Eucharist, of the profound reality which transubstantiation expresses. Often, too, their love of the Holy Eucharist and desire to express their love has taken poetic form, for example, the hymn of Saint Thomas Aquinas, Adoro Te devote (“Devoutly I adore You”), to which our Holy Father refers. Once again, Pope Paul VI underlines the truth which must be reflected in all thinking, speaking and writing about the Holy Eucharist: Every theological explanation which seeks some understanding of this mystery, in order to be in accord with Catholic faith, must firmly maintain that in objective reality, independently of our mind, the bread and wine have ceased to exist after the consecration, so that the adorable body and blood of the Lord Jesus from that moment on are really before us under the sacramental species of bread and wine (n. 15c). Christ makes Himself substantially present to us through the Holy Eucharist with one only end in view, namely that we may receive Him in Holy Communion. “The Eucharistic Sacrifice is intrinsically directed to the inward union of the faithful with Christ through communion;…” (n. 16). The Holy Eucharist is true spiritual food, Christ nourishing the life of the Holy Spirit within us through the reception of His glorious Body and Blood. The sixth chapter of the Gospel of Saint John helps us very much to understand the Eucharistic Banquet. Christ made it clear that only by eating His Body and drinking His blood can we have life within us. The disciples understood the true import of His teaching, for, from that day, some refused to believe and left His company. Holy Communion, participation in the Eucharistic Banquet, is Christ’s way of sustaining His life poured out within us at the moment of our baptism, and strengthened and increased within us from the moment of our confirmation. The Sacraments of Initiation — Baptism, Confirmation and the Holy Eucharist — are essentially related to one another. “Thus by the gift of his body and blood Christ increases within us the gift of his Spirit, already poured out in Baptism and bestowed as a ‘seal’ in the sacrament of Confirmation” (No. 17). Communion in the Body and Blood of Christ is already now a participation in the fullness of communion with God, which will be ours in the Heavenly Kingdom. The Holy Eucharist is likewise the Spiritual Food to sustain us along life’s pilgrimage home to God the Father. In the wonderful words of Saint Ignatius of Antioch, Holy Communion is “a medicine of immortality, an antidote to death.” That is why the Church so much desires that the dying receive Holy Communion and calls the Holy Communion of the dying by a special name, Viaticum, food for the journey from this life to the next. Proclaiming the death of the Lord “until he comes” (1 Cor 11:26) entails that all who take part in the Eucharist be committed to changing their lives and making them in a certain way completely “Eucharistic” (No. 20c). After having reflected upon the Holy Eucharist as the mystery of faith (Chapter One), Pope John Paul II next considers the Holy Eucharist as the source of the strength and growth of the Church. The Holy Father is inspired by the teaching of the Second Vatican Ecumenical Council, which reminds us that the work of our redemption continues to be carried out in the Church, principally by the offering of the Sacrifice of the Mass. The teaching of the Council also underlines for us the truth that the unity of all the faithful in the one Body of Christ is “both expressed and brought about” in the celebration of the Holy Eucharist (n. 21a). The importance of the Holy Eucharist for the life of the Church, from her very beginnings, cannot be emphasized enough. The celebration of the Holy Eucharist was, in fact, the source of the life of the Church at her very beginnings. On the night before He died, Christ, in the company of the Apostles, instituted the Holy Eucharist, in order that, through the priestly ministry of the Apostles, the faithful might always share in the spiritual fruits of the sacrifice which He would carry out on Calvary on the following day, Good Friday. The 12 Apostles, symbolically recalling the 12 tribes of Israel, represent the new People of God, embracing all the nations, called to life from the pierced Heart of Christ and sustained in life from the glorious Heart of Christ now seated at the right hand of the Father. The Last Supper, which is the First Eucharist, “laid the foundations of the new messianic community, the People of God of the New Covenant,” just as the sacrifice at Mount Sinai had sealed the Old Covenant. Rightly, we can say that Christ constituted the Church at her beginnings at the Last Supper (n. 21b). When our Lord transformed the bread and wine of the Last Supper into His true Body and Blood, He made possible our communion with Him through the Most Blessed Sacrament. Through the institution of the Holy Eucharist, our Lord made it possible for us to become one body with Him. Our Lord instructed the Apostles to renew His Supper, so that the People of God might be built up in every time and place through communion with Him, that is communion in His true Body and Blood (n. 21c). Our Holy Father makes clear the profound meaning of Eucharistic communion for our life in the Church by reminding us that we not only receive Christ in Holy Communion but He also receives us. Christ truly calls us friends by inviting us to the Eucharistic Sacrifice and Banquet. In other words, Christ deeply desires that we be in His company and that He be in our company, and He fulfills His desire, best of all, through the Eucharistic Banquet and Sacrifice (n. 22a). Communion with Christ in the Holy Eucharist has enabled the Church, from her very beginnings, to carry out her mission of being a sign of salvation in Christ for all the nations. The Church is constituted to carry out the mission of Christ in the world. Christ alive within the Church continues His saving work. The Holy Father recalls the definitive words of our Lord Jesus: “As the Father has sent me, even so I send you.” (Jn 20:21) At the celebration of the Holy Mass, the Church receives her mission which is to share in the mystery of Christ’s Suffering, Dying and Rising from the Dead. At the same time, at the Mass, she also expresses most fully the same mission of bringing all mankind into communion with God — Father, Son and Holy Spirit (n. 22b). Participation in the Eucharistic Sacrifice and Banquet sustains the Church in the unity which her members enjoy because of Baptism. All of the Church’s members are incorporated into Christ, become truly members of the Body of Christ, through the waters of Baptism. The Holy Eucharist nourishes the life of Christ within us from the moment of our baptism. It is in virtue of our unity with Christ in Baptism and in the Eucharist that we are also one with each other. The Holy Eucharist confirms the unity of the many members of Christ (n. 23a). The unity of the Church has its source in the “joint and inseparable activity of the Son and of the Holy Spirit” (n. 23b). The Church is called into being through Christ’s Passion, Death and Resurrection, by which He has won the outpouring of the Holy Spirit upon us, Her members. Christ was conceived by the Holy Spirit in the womb of the Blessed Virgin Mary. Christ became incarnate for our salvation through the action of the Holy Spirit. It is also the Holy Spirit who overshadows our gifts of bread and wine at the Mass, transforming them into the true Body and Blood of Christ. The Holy Spirit unceasingly nourishes and strengthens His life within us through the incomparable spiritual food which is the Body and Blood of Christ. The Holy Eucharist binds brothers and sisters in Christ in the deepest possible unity, far beyond any merely human bond. Participation in the Eucharistic Sacrifice and Banquet is not merely sharing a meal together. Rather, it is sharing in the divine communion which alone can bring mankind to unity and peace (n. 24a). There is in us, at one and the same time, the deepest desire of communion with one another and the tendency to division, what our Holy Father calls the “seeds of disunity,” due to original sin and our actual sins (n. 24b). The Holy Eucharist fulfills our desire for unity with one another in a way beyond all our imagining; it makes us one with each other in the divine Son of God. Our unity with one another has its origin in God. It cannot be destroyed by any human force and has its eternal fulfillment in the life which is to come. At the same time, the Holy Eucharist strengthens us, so that we may purify ourselves of the seeds of disunity. Communion with Christ strengthens us to overcome, with Christ, the division which sin always introduces into our lives. Here we see the essential connection of the Holy Eucharist and Penance. Through the confession of our sins, which separate us, in varying degrees, from God and from another, we are prepared to receive the Body and Blood of Christ, uniting us to God and to one another. At the same time, receiving the Body and Blood of Christ enlightens our minds and inflames our hearts to see what keeps us from unity with God and with each other, and to root out from our hearts these seeds of disunity. In the context of reflecting upon how the celebration of the Holy Eucharist builds up the life of the Church, the Holy Father underlines the importance of worship of the Blessed Sacrament outside of Mass. He reminds us that, the Real Presence of Christ under the species of bread and wine, from the moment of the Consecration of the Mass, remains as long as the species themselves remain, and that, therefore, the Church reserves the Body of Christ in the tabernacle after the distribution of Holy Communion. The reserved Blessed Sacrament comes directly from the Sacrifice of the Mass and inspires the desire for Holy Communion, also spiritual communion when it is not possible to receive sacramental communion. So important is worship of the Blessed Sacrament that our Holy Father reminds bishops and priests of their responsibility “to encourage, also by their personal witness, the practice of Eucharistic adoration, and exposition of the Blessed Sacrament in particular, as well as prayer of adoration before Christ under the Eucharistic species” (n. 25a). Our Holy Father draws our attention to the profound reality of prayer before the Blessed Sacrament. It is spending time with the Lord. He likens it to the experience of the Beloved Disciple who rested his head on the breast of the Master. Through prayer before the Blessed Sacrament, we experience the inexhaustible love of the glorious Sacred Heart of Jesus, from which Christ unceasingly pours forth His grace upon us. How often, dear brothers and sisters, have I experienced this, and drawn from it strength, consolation and support! (n. 25b). Church teaching urges us to pray before the Blessed Sacrament. The example of the saints inspires us to treasure, in a most special way, Eucharistic adoration. Our Holy Father quotes Saint Alphonsus Liguori: “Of all devotions, that of adoring Jesus in the Blessed Sacrament is the greatest after the sacraments, the one dearest to God and the one most helpful to us” (No. 25c). Through the Holy Eucharist, first of all by participation in the Sacrifice of the Mass and then by Eucharistic worship outside of Mass, we contemplate the Face of Christ as directly and fully as is possible for us on this earth. From our contemplation of the Face of Christ, we will draw the grace to live in Christ every day. It is the Holy Eucharist, above all, which builds up the Church in unity and love. In the beginning of the third chapter of his Encyclical Letter Ecclesia de Eucharistia, Pope John Paul II reminds us that the relationship between the Church and the Holy Eucharist is so intimate that the marks of the Church — one, holy, catholic and apostolic — also describe the Holy Eucharist. He then devotes the third chapter to a reflection upon the apostolic character of the Holy Eucharist (n. 26). The Holy Father describes the three meanings which the apostolic character or apostolicity of the Church has. First of all, it means that the Church “was and remains built” upon the foundation of the Apostles. So, too, the Holy Eucharist was entrusted by Christ to the Apostles and has come to us through the unbroken succession of the apostolic ministry (n. 27a). Secondly, apostolicity means that the Church hands on the “deposit of the faith,” received from the Apostles. So, too, the Church celebrates the Holy Eucharist “in conformity with the faith of the Apostles.” The Holy Father points out that the teaching authority of the Church has necessarily defined “more precisely” the doctrine on the Holy Eucharist, in order to remain true to the faith of the Apostles. He states: “This faith remains unchanged and it is essential for the Church that it remain unchanged” (n. 27b). Thirdly, the Church is apostolic because the Bishops, successors to the Apostles, teach, sanctify and guide the Church. They carry out the apostolic ministry in communion with the Holy Father, Successor of Saint Peter, Head of the Apostles, and with the assistance of priests who share in their apostolic ministry. The existence of the Church depends upon the unbroken succession of the apostolic ministry. The Holy Eucharist also depends upon the apostolic ministry of the Apostles and their successors, for it is only the ordained priest, acting in the person of Christ, who can offer the Eucharistic Sacrifice on behalf of all the faithful. The third sense of the apostolic nature of the Holy Eucharist helps us to understand the reason why only the priest recites the Eucharistic Prayer, “while the people participate in faith and in silence” (n. 28b). The ordained priest offers the Eucharistic Sacrifice in virtue of the Sacrament of Holy Orders, by which he is configured to Christ, Shepherd and Head of God’s flock. The ordained priest does not take the place of Christ in the offering of the Holy Eucharist, but Christ acts in him. In other words, the Holy Eucharist remains always the action of Christ. The Holy Eucharist can be offered “in the person of Christ” only in virtue of the sacramental grace of Holy Orders. For that reason, the manner of the priest, in offering the Mass, should always point to the person of Christ and not to the person of the priest (n. 29a). The congregation gathered for the celebration of the Holy Eucharist requires the ministry of the priest. The priestly ministry is necessary, so that the celebration of the Mass is one with the sacrifice of Calvary and the Last Supper or First Eucharist, for Christ acts in the priest. The congregation by itself, that is without the presence of the priest, is incapable of renewing the Eucharistic Sacrifice (n. 29a-b). The most important responsibility of a bishop, therefore, is to ordain priests, so that they may offer the Eucharistic Sacrifice for God’s holy people. The ordination of a priest by a successor of the Apostles means that the ordained priest is a gift received from Christ Himself (n. 29b). The reflection upon the relationship of the ordained ministry to the Eucharistic Sacrifice points to a significant area of division between the Roman Catholic Church and the Ecclesial Communities which have sprung up in Europe and beyond, beginning with the Protestant Revolt in the 16th century. The Second Vatican Ecumenical Council reminded us that, because these Ecclesial Communities do not have the Sacrament of Holy Orders, they have not preserved the Sacrifice of the Mass in its integrity (n. 30a). It is because of the significant difference of belief regarding the Holy Eucharist that Catholics are not permitted to receive the communion which is given in these Ecclesial Communities. Otherwise, a serious question could be raised about the Catholic faith in the Holy Eucharist, causing confusion about a central doctrine of the faith. For the same reason, it is never permissible to substitute participation in an ecumenical prayer service or in the liturgical services of one of the Ecclesial Communities for participation in Sunday Mass. While participation in ecumenical services can help lead us to a fuller unity, it cannot replace Eucharistic communion (n. 30b). Finally, the Holy Father points out that the restriction of the power to consecrate the Holy Eucharist to Bishops and priests alone “does not represent any belittlement of the rest of the People of God, for in the communion of the one body of Christ which is the Church this gift redounds to the benefit of all” (n. 30c). The Holy Eucharist is the heart and the highest expression of the Church. It is, therefore, also “the center and summit of priestly ministry” (n. 31a). The Holy Eucharist, in fact, is the reason for the existence of the priestly vocation which Christ instituted at the Last Supper. The Holy Father sensitively observes that the volume and variety of priestly activities and the fast pace of life in society, in general, could easily cause a loss of focus on the part of priests. The pastoral charity, which is expressed in every truly pastoral act of a priest, comes chiefly from the Holy Eucharist. For that reason, the priest necessarily seeks in the Eucharistic Sacrifice and in Eucharistic worship outside of Mass the direction and strength for all of his pastoral activity. The heart of the priestly ministry in the Eucharistic Sacrifice explains also the Church’s discipline by which a priest is to offer Mass daily, even if he is without a visible congregation, for the Mass is always “an act of Christ and the Church” (n. 31b). As one of my professors of Canon Law observed, a priest never offers the Mass alone, for the whole company of Heaven assists at every offering of the Mass. The priest who centers his whole priestly life and ministry on the Holy Eucharist will overcome the tendency to lose his focus because of the many demands of his pastoral office. He will not become overwhelmed by the demands of his priestly ministry, for he will be united with Christ in bringing Christ’s pastoral charity to God’s flock. Given all of the above, it is clear that the Holy Eucharist must be at the center of the formation of future priests. First of all, the manner in which a priest celebrates the Mass and brings the Holy Eucharist to others outside of Mass will inspire very much those whom God is calling to the ordained priesthood. The manner of participation of all of the faithful will also contribute very much in assisting a young man to recognize the call to the priesthood and to respond to it wholeheartedly. Those called to the priesthood will discover God’s call before the Blessed Sacrament, through frequent and attentive participation in Holy Mass and through Eucharistic devotion. In the context of the place of the Holy Eucharist in the life of the Catholic community and the necessity of the Eucharistic ministry of the ordained priest, the Holy Father reflects upon the great distress caused to the Church by situations in which a congregation of the faithful is without a priest. It will be very difficult for those called to the priesthood to recognize God’s call without the active involvement of the priest, especially his offering of the Mass (n. 32a). The Holy Father refers to the various temporary solutions to the situation of a congregation without a priest. Prepared members of the laity or prepared consecrated persons, drawing upon the common grace of Baptism, lead the faithful in a prayer on Sunday and may distribute Holy Communion consecrated at an earlier celebration. What is essential is to point out always to the congregation that the situation is temporary and that the congregation must pray and sacrifice, so that God calls more young men to the ordained priesthood. The serious deficiency of the situation should inspire everyone to develop and use all of the resources needed for an effective apostolate of priestly vocations (n. 32b). Finally, the Holy Father points out that the laity or consecrated persons who share in the pastoral care of the parish are obliged to do all that they can to foster the love of the Holy Eucharist among the faithful and their desire to participate in the Mass celebrated by a validly ordained priest. In this way, as the Holy Father observes, the congregation will never miss the opportunity to participate in the Holy Mass offered by Christ through the ministry of His priest. Our continuing reflection upon the Holy Eucharist leads us to preserve the integrity of our Eucharistic faith in our relationships with members of Ecclesial Communities, so that we do not compromise, in any way, our witness to the Holy Eucharist, God’s most wonderful gift to us in Church. Likewise, it leads us to an ever deeper love of the vocation to the ordained priesthood and to the pastoral service of priests, above all in the offering of the Eucharistic Sacrifice. The Second Vatican Ecumenical Council emphasized very much the nature of the Church as communion. The Council presents, with a particular richness, the teaching regarding the Church, what is technically called ecclesiology, and views the Church, most of all, as the instrument for safeguarding and fostering our communion with God — Father, Son and Holy Spirit — and our communion with one another as members of the Church. In the celebration of the Holy Eucharist the Church expresses best her identity as communion and most fully carries out her mission of safeguarding and fostering communion. Therefore, it should not surprise us that one of the most common names given to the Holy Eucharist is Communion. Pope John Paul II devotes the fourth chapter of his Encyclical Letter “The Church from the Eucharist” (Ecclesia de Eucharistia) to the discussion of the relationship of the Holy Eucharist to communion with God and communion among the faithful in the Church (n. 34). There can be no fuller communion with God than the Holy Eucharist, in which we receive the Body of Christ, God the Son made man for our salvation. For the person of faith, all other goods in life are seen always in relationship to the Holy Eucharist, the greatest good in our life. The measure of the depth of our faith is naturally the strength of our desire to receive Holy Communion. When you do not receive communion and you do not attend Mass, you can make a spiritual communion, which is a most beneficial practice, by it the love of God will be greatly impressed on you (n. 34b). The Holy Father rightly points out that the Holy Eucharist sustains and develops a certain communion which must necessarily precede it and which it expresses. The communion which participation in the Holy Eucharist presupposes has both invisible and visible dimensions. The invisible dimension is the life of grace within us. It is only by God’s grace that we have communion with Him and with one another. God, for His part, gives us the virtues of faith, hope and love, and, we, for our part, cultivate these virtues and the moral virtues by which we, with the help and under the guidance of the Holy Spirit, become more like Christ. The invisible dimension of communion which is the presupposition of Eucharistic communiondemands that we examine ourselves before approaching the Holy Eucharist and that, if we are conscious of having committed a mortal sin, we seek reconciliation with God in the Sacrament of Penance before receiving Holy Communion (n. 36). The Sacraments of the Holy Eucharist and Penance are intimately related to one another. Communion in the Body of Christ necessarily inspires daily conversion of life, which is greatly helped through frequent confession. With the ardent desire of the Holy Eucharist comes also a deep sorrow over the ways in which we offend God and one another. The response to sorrow for sin, even our venial sins, is the reconciliation with God and with the Church, which is God’s gift to us in the Sacrament of Penance. Grave or mortal sin prohibits our reception of Holy Communion, until we have received God’s forgiveness of our sin in the Sacrament of Penance. Eucharistic communion, moreover, will inspire within us the desire to confess also our venial sins, lest we grow complacent or lukewarm in our love of the Eucharist. Each of us must examine his or her conscience regarding the state of grace, which is required to receive Holy Communion. The Holy Father also mentions the case of public conduct which is “seriously, clearly and steadfastly contrary to the moral norm,” and before which the Church is obliged to deny Holy Communion. Such action of the Church is required in order to respect properly the Holy Eucharist and to avoid confusion and scandal in the community of faith (n. 37). The visible dimension of the communion which is the precondition for Eucharistic communion is the bonds of the doctrine of the faith, the sacraments and Church governance (n. 35a and 38a). Reception of the Body of Christ is the manifestation of fullness of communion in the Church and, therefore, demands visible bonds of communion with the Church. Therefore, it is never permitted to give Holy Communion to someone who dissents from the truth of faith regarding the Holy Eucharist or who is unbaptized (n. 38b). Eucharistic communion is also communion with one’s own Bishop and with the Roman Pontiff, for the celebration of the Holy Eucharist in the local community is the celebration of the one Church throughout the whole world. The Bishop is “the visible principle and the foundation of unity within his particular Church.” It is, therefore, a contradiction to speak of the celebration of the Church’s great sacrament of unity when communion with the Bishop is lacking. Likewise, the Holy Eucharist must be celebrated in communion with the Roman Pontiff, the successor of Saint Peter, who is “the perpetual and visible source and foundation of the unity of the Bishops and of the multitude of the faithful” (n. 39b). Participation in the Holy Eucharist, when it is sincere, leads us to examine anything which separates us from one another, and to seek reconciliation. Holy Communion fosters harmony among the members of the Body of Christ. The obligation of participation in Sunday Mass follows from the importance of the Holy Eucharist in fostering communion among all the members of the Church. In the Holy Eucharist, the community of faith finds its true identity, and also the inspiration and strength to conform itself more and more to that identity, overcoming any element of division. All of us have responsibility for the fostering of communion in the Church and, therefore, must exercise a special care of the Holy Eucharist. Those who have pastoral authority in the Church are especially bound to make known and to apply the Church’s “norms aimed both at fostering frequent and fruitful access of the faithful to the Eucharistic table and at determining the objective conditions under which communion may not be given” (n. 42). The Holy Eucharist fosters unity among all Christians through the prayer, which it naturally inspires, that all may be one in Christ. At the same time, because Eucharistic communion requires full communion in faith, sacraments and Church governance, it is not possible to celebrate the Holy Eucharist when those bonds do not fully exist. To attempt the celebration of the Holy Eucharist with those who are not in full communion with the Church is not a means of fostering unity and, in fact, becomes an obstacle to unity because it ignores what yet divides us and causes confusion about truths of the faith (n. 44). 4) they are properly disposed (cf. can. 844, §§3-4). In this regard, the Holy Father reminds us that an essential part of faith in these sacraments is “the truth regarding the need of the ministerial priesthood for their validity.” If the person requesting the Sacraments does not hold to this truth, then he or she is not properly disposed. This also explains the norm by which a Catholic, under certain conditions, may approach a non-Catholic minister to receive these Sacraments, as long as the sacraments are validly celebrated in the Church of the non-Catholic minister (cf. can. 844, §2) (nn. 45-46). The careful consideration of the relationship of the Holy Eucharist to communion fosters in us an ever deeper love of the Holy Eucharist. It also helps us to give faithful witness to the truth regarding the Holy Eucharist, so that the Blessed Sacrament fosters unity within the Church and among all Christians. In Chapter Five of his Encyclical Letter Ecclesia de Eucharistia, our Holy Father takes up the question of the dignity with which the Holy Eucharist is to be celebrated. The heart of the liturgical rites of the Eucharistic celebration is found in the account of the Last Supper, found in the Gospels and in Saint Paul’s First Letter to the Corinthians (cf. Mt 26:26-30; Mk 14:22-26; Lk 22:14-20; Jn 13:1-17; and 1 Cor 11:17-34). At the Last Supper, Christ gave the Holy Eucharist to the Church. In anticipation of His Passion and Death, He handed over His life for us sacramentally. Our Lord’s celebration of the Last Supper was both simple and solemn; it is the foundation and model for the liturgical rites which have developed in the Church down the Christian centuries. He commanded the Twelve to renew His Last Supper in each community of believers until His Final Coming: “Do this in remembrance of me.” In a certain sense, the whole history of the Church may be described as the story of the Apostles’ obedience to our Lord’s commission to them at the Last Supper (cf. Lk 22:19; and 1 Cor 11:24) (n. 47a). To understand the richness of the liturgical rites surrounding the Holy Eucharist over the centuries, the Holy Father refers to the account of the Anointing at Bethany. Mary, the sister of Lazarus whom Christ had raised from the dead, anointed Jesus with a most precious oil shortly before His Passion and Death. Some disciples, most notably Judas Iscariot, the betrayer, objected strongly to her gesture of great reverence and love. Judas and others saw it as a waste of resources which could have been used to care for the poor. Our Lord responds to their reaction in what may be for some a surprising way. He teaches that the anointing by Mary is an act of profound reverence for His body, the instrument by which He has carried out our redemption. He, in no way, calls into question the responsibility which is ours to provide for the poor but indicates what is prior to our care for the poor and inspires it most fully, namely our love of Him, our devotion to His person. Mary’s act of generous respect and love is imitated by us in the care which we take to have only the most fitting place for the celebration of the Holy Eucharist, and to use the best vessels, linens and furnishings for the Eucharistic celebration. The Holy Father reminds us of our Lord’s command to the disciples to prepare the Upper Room for the Last Supper. The Church’s special care for the celebration of the Eucharist reflects her faith in what takes place at the Eucharist; it reflects her deep reverence for our Lord Who is both our Priest and Victim in the celebration of the Mass (n. 47b). In reading the history of our parishes which are celebrating their 100th, 125th or 150th anniversary of foundation, I am always impressed by the great sacrifices which were made by the faithful, most of them immigrants with very little means, to have a parish church. It was not at all uncommon for farmers to mortgage their farm, in order to make a pledge toward the building of a fitting parish church. They had the faith of Mary at Bethany. The beautiful art and architecture which has been associated with our churches and their altars and other furnishings down the centuries is for us an inspiration to reflect upon the great mystery of the Holy Eucharist. The Holy Father rightly asks: “Could there ever be an adequate means of expressing the acceptance of that self-gift which the divine Bridegroom continually makes to his Bride, the Church, by bringing the Sacrifice offered once and for all on the Cross to successive generations of believers and thus becoming nourishment for all the faithful” (n. 48)? The Eucharist is indeed a banquet at which Christ feeds us with His true Body and Blood. But recognition of the heavenly Food of the Holy Eucharist halts any tendency to a familiarity which would fail to recognize the true Body and Blood of Christ. The Holy Eucharist is not adequately described as a banquet or meal, for it is a sacrificial banquet, a sacred banquet in which we partake of the holiness of God Himself. Our Holy Father reminds us that the Bread which we receive is truly the Bread of Angels, the Body of Christ, and, therefore, cannot be approached except with a profound sense of humility, the sense of our own unworthiness because of our sins. When we pray at Mass and, most especially, when we come forward to receive Holy Communion there is at once a sense of God’s great intimacy with us, inviting us to participate in the mystery of His Son’s Suffering, Death and Resurrection, and a sense of great awe before the presence of God Himself. That is the reason why our churches are not built as meeting or banquet halls. It is also the reason why we should be very attentive to the manner of our dress and our comportment at the Eucharistic Sacrifice and Banquet (n. 48). The outward aspects of the celebration of the Holy Eucharist express our interior devotion, in imitation of Mary at Bethany. For that reason, the Church has developed liturgical laws which govern the fitting celebration of the Eucharist. The law which safeguards the minimum respect for the Holy Eucharist is paralleled by sacred art, sacred architecture and sacred music, developed to express and to inspire faith in the Holy Eucharist. The Holy Father evokes the rich history of sacred architecture, beginning with the churches in the home. The developments in design of churches and of their altars and tabernacles is not merely a reflection of the great art of various periods of the Church’s history but, most of all, a reflection of the profound faith in the mystery of the Holy Eucharist. The examples of quality craftmanship and original art in the building of churches, and especially of their altars and tabernacles, from the first days of the Church, is a wonderful story of faith in the Holy Eucharist. In visiting beautiful churches, one notes how the various furnishings have been beautifully crafted. Special attention was fittingly given to the production of beautiful vessels to contain the sacred species and beautiful linens on which to place the sacred species or to cleanse the sacred vessels. In the same way, sacred music has developed down the Christian centuries to lift the minds and hearts of the faithful to the great mystery of faith, which is the Holy Eucharist. Gregorian Chant is, of course, the greatest jewel in the body of music written specifically for the celebration of the Holy Eucharist. As is the case with sacred art, there is a rich history of beautiful music written for the celebration of the Mass (n. 49). The Holy Father refers to a certain competition in sacred art and architecture between the East and the West. He reminds us especially of the strong sense of the mystery of faith expressed in the sacred art of the East. It is a call for all of us to make certain that the Church is above all else “a profoundly Eucharistic Church” (n. 50). The Holy Father also reflects upon the legitimate desire of the Church in new places to employ the “forms, styles and sensibilities of different cultures” in the celebration of the Holy Eucharist, so that it can truly be spiritual food for all peoples. (No. 51a) The proper term for the rooting of the Catholic faith and practice in a particular culture is inculturation. Clearly, it is a delicate process because there may be elements of the local culture which need purification and transformation before they can serve the Eucharistic mystery. Inculturation must always be secondary to respect for the mystery of the Holy Eucharist, lest the greatest treasure of our faith be obscured or, even worse, disrespected. Any experimentation in inculturation must be reviewed by Church authority with the involvement of the Holy See “because the Sacred Liturgy expresses and celebrates the one faith professed by all and, being the heritage of the whole Church, cannot be determined by local Churches in isolation from the universal Church” (n. 51b). Priests act in the person of Christ at the Holy Eucharist and, therefore, bear a heavy responsibility for its worthy celebration. They are “to provide a witness to and a service of communion not only for the community taking part in the celebration, but also for the universal Church which is part of every Eucharist” (n. 52a). The Holy Father speaks frankly of abuses which have entered into the celebration of the Holy Eucharist because of “a misguided sense of creativity and adaptation” (n. 52). He begs that the liturgical law pertaining to the celebration of the Holy Eucharist be faithfully observed. He reminds us that the Sacred Liturgy is never the private possession of the priest or the community, and speaks of the deep suffering caused to the faithful by abuses introduced into the celebration of the Mass. Our observance of liturgical law is a fundamental expression of love of Christ and of the Church. Because of the importance of the fitting and dignified celebration of the Holy Mass, the Holy Father announced the prepation of a special document on the matter. He concludes Chapter Five of Ecclesia de Eucharistia with words which should inspire our own great care in approaching the Eucharistic Sacrifice and Banquet: “No one is permitted to undervalue the mystery entrusted to our hands: it is too great for anyone to feel free to treat it lightly and with disregard for its sacredness and its universality” (n. 52). In the final chapter of his Encyclical Letter Ecclesia de Eucharistia, our Holy Father reminds us that, if we want to ponder the profound mystery of the Holy Eucharist, especially its relationship with the Church, then we must look to Mary, Mother of the Church and also model of the Church. Our Holy Father, in his Apostolic Letter On the Holy Rosary, had already reminded us that our Blessed Mother is our first and best teacher in contemplating the Face of Christ. Recall that the fifth of the Luminous Mysteries of the Rosary is the Institution of the Eucharist, for Mary helps us best to look upon the Face of Christ by leading us to the Holy Eucharist. Our Holy Father observes: “Mary can guide us towards this most holy sacrament, because she herself has a profound relationship with it” (n. 53a). Even as Mary always leads us to Christ, her Son, so she will lead us to the Blessed Sacrament, the true Body and Blood of her Son. Mary guides us to the Holy Eucharist in two ways. First of all, our Blessed Mother certainly participated in the Holy Mass from the very beginning of the Church’s life, even as she was present with the Apostles in the Cenacle after the Resurrection, praying with them for the Descent of the Holy Spirit. By exercising her ecclesial maternity, Mary leads us to the Holy Eucharist. Mary also guides us to Christ in the Blessed Sacrament by the whole manner of her life, which can aptly be described as Eucharistic. Mary is, above all, a “woman of the Eucharist.” In this way, she is the model of the Church. By her Eucharistic manner of life, Mary invites us “to imitate her in her relationship with this most holy mystery” (n. 53c). The Holy Eucharist is a mystery of faith, which goes beyond our capacity to understand and requires that we trust completely in the Word of Christ. Mary teaches us to grow in the theological virtue of faith. Her disposition of faith, which we are called to imitate, is perhaps best expressed in the Gospels in her words to the wine stewards at the Wedding Feast of Cana: “Do whatever he tells you.” (Jn 2:5) Mary shows her maternal care of us by urging us to go to Christ, to put our faith in Him, to trust in His words spoken at the Last Supper, that is to believe that the Eucharistic species of the bread and wine are, in truth, the Body and Blood of Christ (n. 54). We see Mary’s disposition of faith in her response to the Archangel Gabriel at the Annunciation. At her words, “Let is be done to me as you say,” God the Son came into the world by becoming incarnate in her womb through the overshadowing of the Holy Spirit. At the moment of the Incarnation, Mary anticipated what happens for us faithful at every Eucharist: Christ becomes present for us, under the species of bread and wine, so that we may receive Him into our very being. Our Holy Father points out the profound similarity between Mary’s belief in the words of the Archangel Gabriel and our belief in approaching Holy Communion. When the priest announces, “The Body of Christ,” we respond “Amen.” Our “Amen” is like Mary’s “Fiat (Let it be done)” (n. 55b). Mary expressed already the Church’s faith in the Holy Eucharist at the moment of the Incarnation. She became, as our Holy Father states, “the first ‘tabernacle’ in history — in which the Son of God, still invisible to our human gaze, allowed himself to be adored by Elizabeth, radiating his light as it were through the eyes and the voice of Mary” (n. 55c). Reflecting upon the relationship between Mary’s faith at the Annunciation and Birth of our Lord, and our faith in the Holy Eucharist, we are inspired to express ever deeper devotion and love every time we are blessed to be in the presence of the Blessed Sacrament or to receive Holy Communion. Mary also anticipated, by her whole life, the Church’s share in the sacrifice of Christ through the Holy Eucharist. Just as we are most perfectly united with Christ through participation in the Holy Eucharist, so Mary, from the very moment of the Incarnation, poured out, with her Incarnate Son, her entire life. Simeon had expressed the sacrificial nature of Mary’s divine maternity when she presented our Lord in the Temple. Simeon stated so directly: “A sword of sorrow will pierce your own heart” (Lk 2:34-35). Her participation in Christ’s Suffering and Death reached its fullness at the foot of the cross. Her share in Christ’s sacrifice, after His Death and Resurrection, was continued through her participation in the Holy Mass. Our Holy Father exclaims: “The body given up for us and made present under sacramental signs was the same body which she had conceived in her womb” (n. 56b)! Who, then, can better teach us to unite ourselves to the sacrifice of Christ in the Holy Eucharist than Mary. She leads us to unite our hearts, like her Immaculate Heart, to the Sacred Heart of Jesus, poured out in perfect love of God and of neighbor. The Holy Father reminds us that all that Christ accomplished for us on Calvary is made present for us in the Holy Mass. This is the meaning of His words: “Do this in remembrance of me” (Lk 22:9) (n. 57a). Therefore, at every Eucharist, Christ once again gives Mary to us as our Mother and gives us to her as her true sons and daughters, as He did when He died on the cross for us. Concretely, this means a commitment on our part to be faithful students at the School of Mary, to permit Mary to exercise fully her maternal care of us, so that we may become more and more like Christ. Our Blessed Mother is always with us at every celebration of the Holy Eucharist. The Church never celebrates the Holy Eucharist without commemorating our Blessed Mother, present with us and leading us to Christ and leading us to be obedient to what He tells us (n. 57b). Our Holy Father invites us to pray the Magnificat, Mary’s prayer at the Visitation, while meditating upon the great gift of the Holy Eucharist. In the Magnificat, we find expressed in a most wonderful way Mary’s Eucharistic attitude and way of being. The Magnificat is a prayer of praise and thanksgiving, as is every celebration of the Holy Eucharist for us. With Mary, we praise God through Jesus, our Savior, but also we praise God in Jesus and with Jesus. We praise God for all His wonders, but, most of all, for the greatest of His wonders, the Incarnation. Finally, the Magnificat expresses the hope for and anticipation of “the new heavens” and “the new earth,” at Christ’s Final Coming. At every celebration of the Holy Eucharist, we experience already the grace which will be fully ours on the Last Day. We experience the truth about our lives and our world, namely that we are made for final glory, we are made to share fully in Christ’s glory, the glory He won for us on Calvary. The Holy Eucharist is the pledge of our future destiny in and with Christ (n. 58b). The Holy Father concludes the Encylical Letter with an expression of gratitude to God for the twenty-five years of his exercise of the ministry of Saint Peter in the Church. He offers his own testimony of faith in the Most Blessed Sacrament. He tells us of how the Holy Eucharist has been at the heart of His priestly life and ministry. Before the Holy Eucharist, our senses fail us. Our senses fail to identify the truth of the Holy Eucharist. Faith, however, is sufficient for us to know the truth and profess the truth of the Eucharist (n. 59b). In the Holy Eucharist, we come to understand the truth about our own earthly journey, our pilgrimage home to God the Father. The truth is that our pilgrimage is with and in Christ. In Him, we live the life of the Holy Trinity and we transform the world, according to God’s plan. Our Holy Father, recalls his insistence, in his Apostolic Letter Novo Millennio Ineunte, that the answer to the meaning of our life pilgrimage is not some new program but rather the person of Christ. The perfection of our life is found in knowing, loving and imitating Christ. Where most do we find Christ and come to understand the mystery of His life for us? It is the Holy Eucharist. Our Holy Father writes: “In the Eucharist, we have Jesus, we have his redemptive sacrifice, we have his resurrection, we have the gift of the Holy Spirit, we have adoration, obedience and love of the Father” (n. 60b). We cannot redesign the Holy Eucharist or exploit it for our own purposes. The Holy Eucharist is always, at one and the same time, Sacrifice, Banquet and Real Presence. The Holy Eucharist also expresses most perfectly the ecumenical dimension of our faith, our prayer with Christ, “that all may be one” (Jn 17:11). The Holy Eucharist increases our desire for full unity with all our brothers and sisters with whom we share Baptism. But it also places before our eyes the real demands of “communion in faith” and “apostolic succession,” the many hurdles which must be overcome before we are fully one with our Christian brothers and sisters. The Holy Father reminds us that we can never show too much care and reverence for the Holy Eucharist, for in it is contained the grace of our salvation. The Holy Father invites us once again to contemplate the Face of Christ in the Holy Eucharist through the eyes of Mary, His Mother and our Mother. At the School of Mary, we will never lose any of our wonder before the great mystery of faith, which is the Holy Eucharist. I close with words of our Holy Father: “In the humble signs of bread and wine, changed into his body and blood, Christ walks beside us as our strength and our food for the journey, and he enables us to become, for everyone, witnesses of hope. If, in the presence of this mystery, reason experiences its limits, the heart, enlightened by the grace of the Holy Spirit, clearly sees the response that is demanded, and bows low in adoration and unbounded love” (n. 62b). May our minds and hearts never fail in wonder and love before the Holy Eucharist, Christ with us now, Christ the pledge of our future glory.